We've all surely seen legalese embedded in awkward or surprising places, and most people simply grow immune to it. Seth and I, however, sometimes take note and think more about the implications of the legal disclaimers we notice or are asked to sign. Here are a couple from our sons' day care which we found interesting. CONFIDENTIALITY NOTICE: This email message is for the sole use of the intended recipient and may contain confidential and privileged information. Any unauthorized review, use, disclosure or distribution is prohibited. If you are not the intended recipient, please contact the sender by reply email and destroy all copies of the original message and any attachments. Thank you. Interestingly, overuse of a CONFIDENTIALITY NOTICE may effectively do the exact opposite and make all email communications non-confidential. Seth found a neat page that explains why in detail. The short story is that if you claim all your email are confidential when you actually do not have a "reasonable expectation of confidentiality" for every message which you append with such a notice, than clearly you are not making special efforts to protect certain information. If the sender is not actually distinguishing between confidential and public communication, they legally can't expect the receiving parties responsibility to do so either. Second, I was a little surprised by a recent owie report advising us to take Arlo to the hospital by ambulance after he got a dime-size bruise when he lost his balance. Mind you, the written notice promoting an ambulance came about two hours after the phone call in which Arlo's teacher (quite sensibly) assured me he was fine and playing happily, having received love and hugs. ...an ambulance is available to transport my child to the hospital. I decline to use the ambulance service. Instead, I elect to seek alternative medical care and I refuse further treatment and/or transport. I have been advised that medical assistance on my child's behalf is necessary, and that refusal of said assistance could be hazardous to my child's health. I have been advised also to discuss my child's medical condition with his/her regular health care provider as soon as possible. I'm thinking Community Gatepath's lawyers are undermining their own efforts. Minor bump. Hospital. Really? To paraphrase some wording from the article on confidentiality notices, the owie report eviscerated the practical effect those lawyers' other notices might otherwise have on me. Community Gatepath recommended an ambulance for the bruise on Arlo's left cheek. 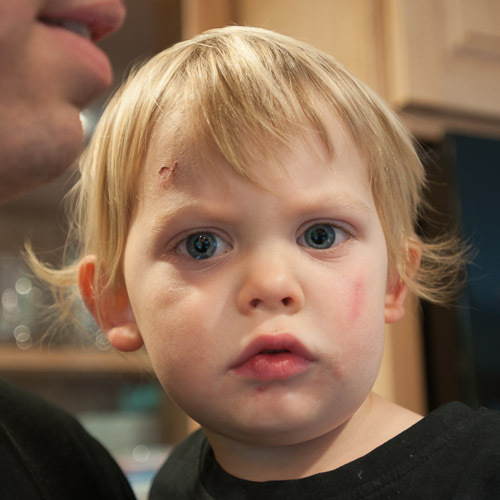 The scrape on his forehead and cut on his lip are from other toddler moments. He had an unusually clumsy week.